This blog provides a central collection of CD reviews, magazine features and academic publications. Where possible, entries are linked to their original publication. ‘Travel first leaves you voiceless, before it turns you into a storyteller’, according to Shams ad-Din Abu Abdullah Muhammad ibn Ibrahim ibn Muhammed ibn Ibrahim ibn Yussuf al-Lawati at-Tanji, the 14th century traveller and qadi (judge) known as Ibn Battuta (‘Son of the Little Duck’). His travels are captured in the famous rihla (travel narrative) he dictated to Ibn Juzayy al-Kalbi in the early 1350s. This double album with accompanying book spans episodes from this rihla over the course of two live concerts – 1304-35, recorded in 2014 in Abu Dhabi with English narration, and 1335-77, recorded in 2016 in Paris with French narration – and was inspired by a new translation: Travels of Ibn Battuta by Margarida Castells and Manuel Forcano (2005). [...] At each turn Savall evokes the atmosphere of a time with results more cinematographic than drily historical. Such a diverse programme and impressive cast of musicians will surely inspire every listener with a sense of wanderlust. 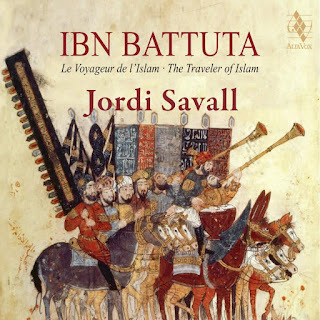 Yet it is perhaps the subtext of this album – travelling through the world before modern borders – which is the most poignant part of Savall’s message for us today. Edward Breen is a musicologist and lecturer at City Lit college, London. He writes for Gramophone magazine and has lectured for Dartington International Summer School, London's Southbank Centre and The British Library. He has also worked as a researcher for BBC Television and written for the journal Early Music (OUP). Edward gained his PhD from King's College London in 2014 entitled The Performance Practice of David Munrow and the Early Music Consort of London. He was supervised by Professors Daniel Leech-Wilkinson and Emma Dillon.